I’ll soon be traveling to Las Vegas, where one of the most important tournaments of the year takes place on April 19. The WPT Championship — a $25,000 buy-in tournament — is held at the Bellagio, and it will pay at least $5 million for first place. I can’t wait! 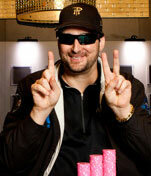 In 2006, I made it down to the money, where I suffered a couple of bad beats and wound up finishing in about 50th place. Last year, I had the chip lead for much of days three and four, only to finish in 18th place when I overplayed pocket jacks. Too many times over the past year, I’ve looked back and wished that I had folded my pocket jacks versus Thomas Wahlroos’ pocket aces. Even though the flop was 9-8-5, I should’ve been able to escape. I didn’t, and the bad memory still stings. It comes down to smarts, because if I had folded that hand, I probably would have made it to the final six players, and perhaps I would have won the whole darn thing. The WPT Championship is the one tournament I want to win as badly as I want to win another bracelet at the World Series of Poker. So, in my opinion, here is the order of importance of modern-day tournaments: the WSOP Main Event; the WPT Championship; the NBC Heads-Up Championship; any WSOP event; the Bicycle Club WPT Championship; the Commerce WPT Championship; the World Poker Open at the Gold Strike in Tunica, Miss. ; the Bellagio “Doyle Brunson Five Diamond” WPT Championship; the Bellagio “Festa Al Lago” WPT Championship; the Foxwoods WPT Championship; and any WPT event. The WSOP Main Event is still the most important tournament in the poker world by far, and it is traditionally the one you need to win in order to carry the title “World Champion of Poker.” These days, a lot of players call themselves “world champions,” usually when they win any WSOP tournament — but that title is supposed to be reserved for Main Event winners. The rest are rated in the above order owing to their importance to the poker world, their tradition or because the great players all want to win that event. Sometimes, the great players don’t want to fly across the country for one tournament, never mind fly all the way to Europe, or Australia, so I have kept those events off the list. In order to win any of the aforementioned tournaments, one key characteristic a player needs to possess is stamina. All of these events are at least three days long, with many five to seven days in length. That’s a lot of poker. Personally, I used to think that I had a lot of stamina, but I have noticed that stamina may be a flaw in my play lately — and it needs to be addressed. I made it to day five at the WPT Championship, and to day six of the Commerce WPT Championship. In both cases, I had bad days along the way owing to fatigue. I played some bad poker on day three of the Commerce and left myself low on chips heading into day four. I knew that I was tired, but I expected to hold up anyway. Exercise and proper diet help, but I think sleep is the key. Without sleep, I lose my edge, whatever that may be. Personally, I play too many hands when I’m exhausted, and I don’t read people as well, either. One move that I have used successfully is the late-night workout. So after play finishes (2 a.m. at the WSOP), I rush off to the gym and work out. This clears my brain of a stressful day’s ups and downs, and allows me to turn my mind toward the next day and what I need to do. Still, sleep is sometimes hard to come by, and I played like an idiot on day four of the last WPT Championship. I would have been better off taking a 15-minute nap in the middle of play! By the way, I have done that more than once in the past. I may have to go back to an old trick: Leave eight minutes before the 15-minute break, and grab a nap. Then do the same at the hour-long dinner break. Another trick: the “put your head in your hands and nap during play” move. I put my head down and my hands out in front of me, and when the cards hit my hands — because the dealer dealt them — then I know that I have to look up and act. When dealing with fatigue, try some of my tricks — or invent your own.